This year's Congressional Budget Office (CBO) budget outlook was a slight improvement over last April's, although it still shows a troubling outlook. However, the entire improvement can be explained by two factors that may be at least partially temporary: a lower level of disaster spending and recently imposed tariffs. In total, CBO projects deficits through 2028 will be roughly $1.2 trillion lower than previously projected. Two-thirds of this decrease can be attributed to a "reduction" in emergency funding enacted this year compared to last year. Last year saw an unusually large amount of emergency spending responding to multiple 2017 hurricanes, with supplemental spending totaling over $125 billion. Since CBO assumes uncapped discretionary spending grows with inflation each year, this higher level of emergency spending was built into all future years in CBO's previous projections. But Congress hasn't appropriated nearly any disaster funding yet this year – only $1.7 billion – meaning that future years basically assume no supplemental appropriations will be made. However, major proposals in both the House and Senate would add $12 billion to $13 billion of supplemental appropriations for this year (and carried into future years), and it is likely at least some future years will have them as well. While the old projections may have shown disaster spending that was artificially high, these projections are artificially low. They are based on almost nothing being spent on disasters in any future year. Because spending has not yet been allocated in FY 2019, lawmakers saved $686 billion over ten years on paper. 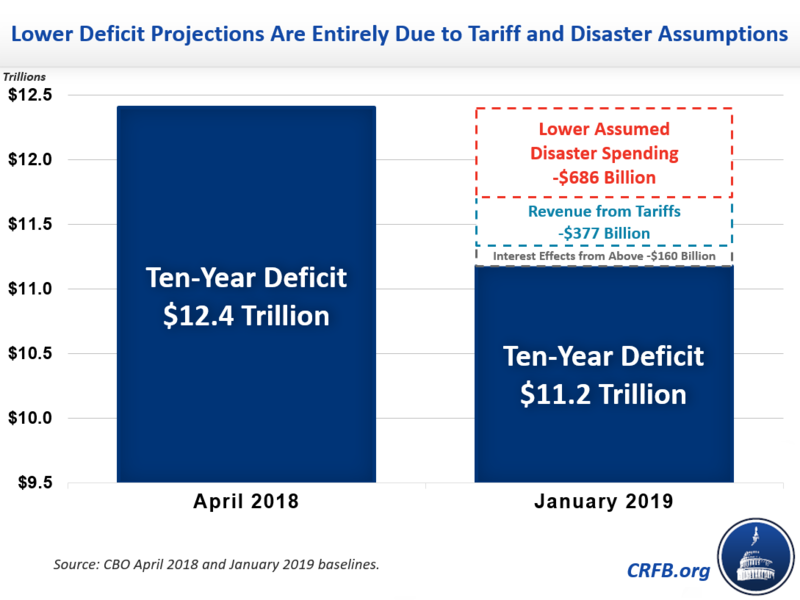 Second, the tariffs that President Trump imposed last year will raise revenue, and CBO's baseline assumes they will continue indefinitely and raise $377 billion of revenue over ten years. If the tariffs are being used as leverage to secure more favorable trade deals, they would be removed after deals are reached. Alternatively, a future President could undo them, since the tariffs were done via executive authority. After including related interest savings, we estimate these two revisions reduced 2019-2028 deficits by $1.223 trillion, almost identical to the entire revision in CBO's budget projections. Even with these modest improvements, the debt situation is stark, with debt projected to rise from 78 percent of GDP this year to 93 percent by 2029 and 152 percent by 2049. To make matters worse, the improvement in this outlook may be entirely temporary.